Feng-Shui-Correct clothes are those that you are happy that you acquired. They live in your closet for a long time, and when they have finally outlived their usefulness or beauty, you let go of them with a bitter-sweet feeling of nostalgia. Feng-Shui-Correct clothes do not become clutter, and do not create negative feelings in you when you wear them. The next time you go clothes shopping, follow this 6-Step Elimination Plan for Purchasing Feng-Shui Correct Clothes. 1 – If you do not love it on the rack, don’t take it off the rack. 2 -If you love a garment on the rack, take it off the rack and check the tags. Is it made of a material you like and don’t have adverse reactions to? If it is made of a material you dislike or would give you a rash, or make you sweat too much or smell bad, put it back. 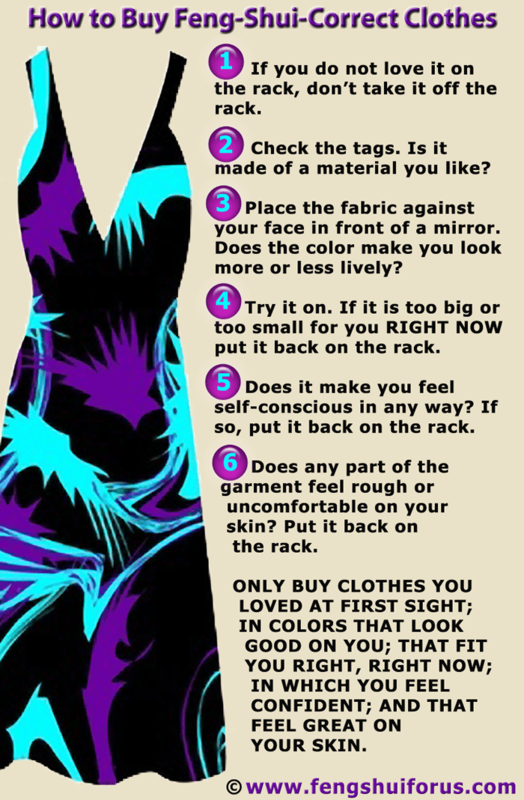 3 – If you love it on the rack, take it off the rack, then place the fabric against your face in front of a mirror. Does the color make you look more or less lively? A color that makes you look less lively is depleting your chi. If a color does not look good against your skin, do not try it on. Put it back on the rack. 4 – If you love the way a garment looks and the color looks good on you, then try it on. If it is too big or too small for you RIGHT NOW put it back on the rack. 5 – If the garment fits but makes you feel self conscious in any way, put it back on the rack. 6 – If the garment fits but it feels uncomfortable in any way or if the fabric or any part of it feels rough on your skin (seams zippers, etc), put it back on the rack. Only buy clothes you loved at first sight, in colors that are good for you, that fit you right, right now, in which you feel confident, and that feel great on your skin. Start by removing from your closet any clothes that are stained or torn and than cannot be salvaged. Look at your closet objectively and take out any items of clothing that you simply do not like and haven’t worn in a while. Engage your sense of touch and feel all the items in your closet. Are there any fabrics that you do not like to touch, or that make you itch or sweat too much? Let them go. Next, go over every single blouse, shirt, top or sweater in your closet and hold them by your face in front of the mirror. Do not try them on, simply look at the colors next to your complexion. Are there any garments that make you look pale, sad, or unhealthy? Let them go. Try on the remaining items and take out any that are too big for you. Keep garments that feel tight on you but that still fit and that you love. If it fits tight and you do not love it, let it go. Let go of clothes that fit right and that you like but that make you feel self-conscious or uncomfortable. Take out any clothes that fit you right but that don’t make you look good. feng shui correct clothes. Bookmark.